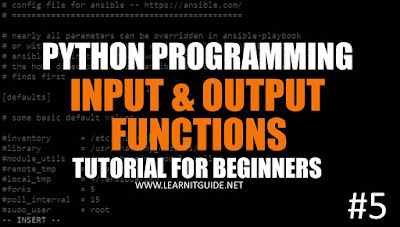 This article explains you about the basic input and output function available in python. So that a program can get an input from the user and perform some actions. Similarly, output function will be used to print or display on the screen as a output. In the previous articles, we have explained you the below topics that will help you to understand this articles much better from basics. Lets see an example by writing a simple program. 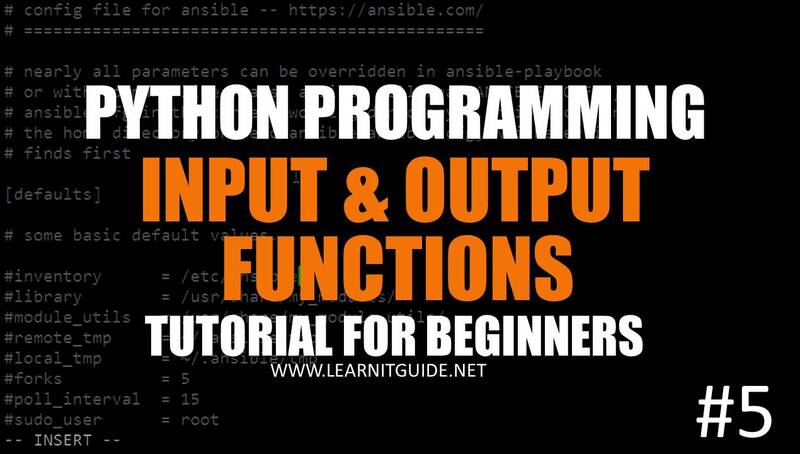 Also Watch this "Input and Output function" Tutorial video free on our YouTube Channel. Print function is used to print or display on screen as a output. Where 'print" is the function to print the message enclosed within quotes and brackets. Any data within single quote or double quote will be considered as a string and printed as it is. Hence the above will be printed as it is. Lets see a simple program which print the value assigned to a variable. In the above program "myprog.py", we have declared a variable "name" with the value "LearnITGuide.net" and used the print function to print the value of variable "name". Here, We didnt specify any quotes within brackets. Hence this is not string and print function will check for the value of a variable "name" in the program it will print the value of the variable, If it didnt find the variable value, then you will get an error as "name" is not defined. You can also use multiple strings within print function separated by commas when need. Lets have a look on below example where used old and new print function. First line printed the value as expected, but the second line printed with some brackets. Because, Second print function syntax is not compatible with current interpreter, so you can use new feature like this at the beginning of the line. __future__ is a pseudo-module which programmers can use to enable new language features which are not compatible with the current interpreter. Re-run the program to see the difference. Both are similar. Its upto us to decide which one to use, but always use the enhanced feature. lets see how to print the message along with variable value. In the above program, we have declared a variable "name" with value "Bob" and used the print function to display the value of a variable "name" in the display as "Hello Bob, Welcome to LearnITGuide Tutorials". So far, we have seen a program with assigned value for a variable within the program as below. On some cases, we may wanted to take the input from user. We have two basic functions which are input and raw_input, earlier we used input() in the older python, now we have raw_input(). where "Display message" is the message we wish to display on the screen to get the user input. Above program not displayed the value, we have not used any print function. If you wanted to print the value of the user input, Declare a variable and get an input from the user, also use the print function as below. lets see one more example for some basic calculation by getting an input from user for two variables and print the value after calculation. Where, "x" and "y" are variables to assign values entered by the user and it perform the multiplication. Again assign the value to variable "z" and print the final value. Note : With raw_input function, value will be taken as a string, strings cannot be used for mathematic operations. so we need to convert it using int function. or we can use the input function which accepts the input as integers. Option 1 : using int function to convert the string to numbers. Option 2 : using input function rather than using raw_input function. Input function only takes as a numbers. January 29, 2018 1 Please Share a Your Opinion.